The death of a missionary | Walk with us! Fr. Johnny Klingler, who has been in the Philippines for the past several weeks teaching English, represented the U.S. Province at the funeral for Fr. Tom Fix in Indonesia. An American SCJ, Fr. 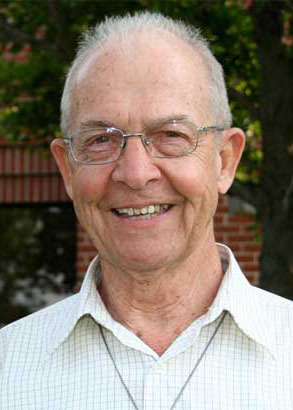 Tom spent all but three of his 53 years of ordination as a member of the Indonesian Province. On Saturday night, April 21, we received the call that Fr. Tom was in critical condition. Sunday morning, around 9:00, another call telling us he died. Soon after, Fr. Francis Pupkowski, superior of the region, called Fr. Vincent Sri Herimanto, superior in Manila, to arrange a ticket for me. I left Cagayan de Oro at 11:30 a.m. for Manila and then to Jakarta. I arrived at 2:30 a.m. Fr. Aloysius Suyoto met me at the airport. He told me that we had to fly to Palembang at 4:00 a.m. I caught about 45 minutes of sleep. When we arrived at the airport there were a significant number of people waiting to go Palembang for the funeral. I believe most were from the SCJ parish of St. Steven. What touched my heart were the number of people who came to the airport just to say goodbye with wishes for a good flight. It was their way of going with us. Fr. Hadrianus Wardjito, a former general councilor, was there. He brought water and food for our refreshment. The plane ride took only an hour. We arrived at the SCJ community and the seminary of St. Paul. The Mass of the Resurrection would take place in the chapel. There were many people, many SCJs waiting for the body of Fr. Tom to arrive for the visitation. The community prepared food and drink for all. His body lay in a white coffin and looked so peaceful. The people came and the visitation continued up to the Mass, which would take place at 3:00 p.m. I went to the community of the Sisters of Charity where a room was prepared for me. I got about an hour of sleep before we returned for the Mass. The chapel holds approximately 500. It was overflowing with extra chairs in the side and back and many chairs placed outside at the open sides of the chapel. Bishop Aloysus Sudarso presided. At the altar with him were the provincial of the Indonesia Province, Fr. Andreas Madya Sriyanto, former provincial Fr. Sapta Dwi Handaka, Fr. Nico Steekelenburg, one of the few Dutch priests still in Indonesia, and myself. It appeared to me that the whole province of SCJs was there as there were so many. There were also many religious sisters and many lay people. The presence of so many people was overwhelming and spoke so much of Fr. Tom. The choir of young seminarians was so beautiful. Hearing them was like hearing music from heaven. “I am very happy to be here with all of you who knew and loved Fr. Tom. I thank the Lord that I was able to come. It is a privilege for me to be here with you, Bishop Al, and you my SCJ brothers. “It is an honor for me to represent my SCJ brothers in the United States Province and the family of Fr. Tom. “When I think of Fr. Tom, many words come to my mind: he was a loving person, compassionate, spoke only about the good of persons, did not judge others, loved to laugh, and smiled so much. He was happy man. “He was man of prayer, who loved his Lord so much. He was a holy man, and he loved being an SCJ with you, his brothers. He loved Indonesia and its people. Tom was buried in a crypt in the convent of the Sisters of Charity. The sisters prepared a meal for all. When supper was over, I and Fr. Donatus Kusmartono, visited with the bishop at his home. I’m glad you were able to go and say such beautiful words about father Tom. I’m sure he was listening in heaven!